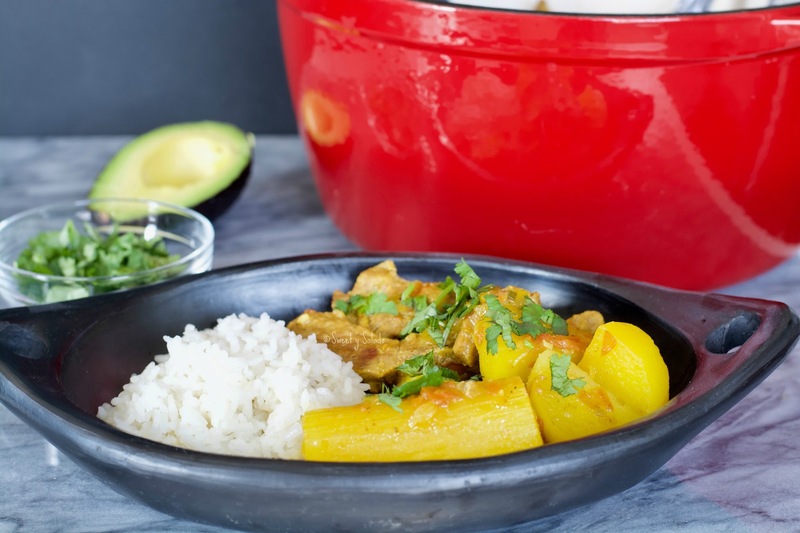 I know what you’re thinking, another Colombian stew recipe? And my answer to that is… yes! 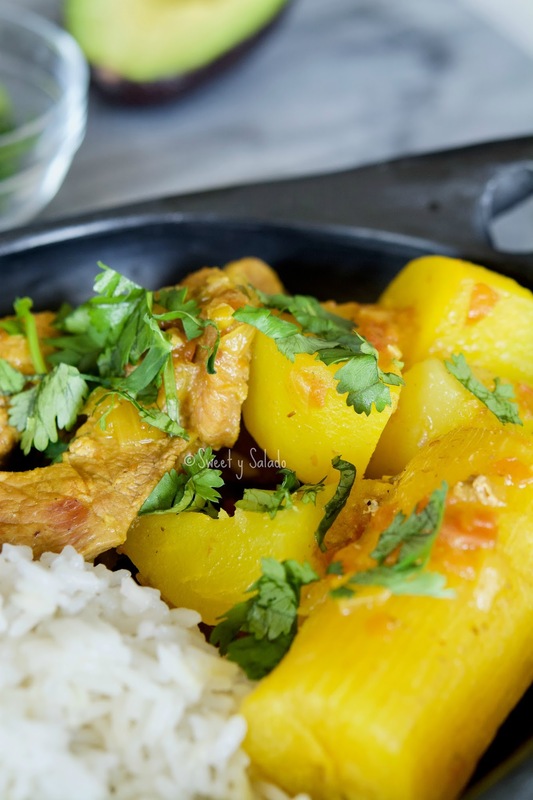 Colombia is a country of soups and stews and we will make all kinds of variations using different types of meat. After posting the chicken and beef versions many of you asked me for a pork version and that’s what we’ll be making today. After this, I think the only one I have left to make would be a fish stew but I’m not really sure. 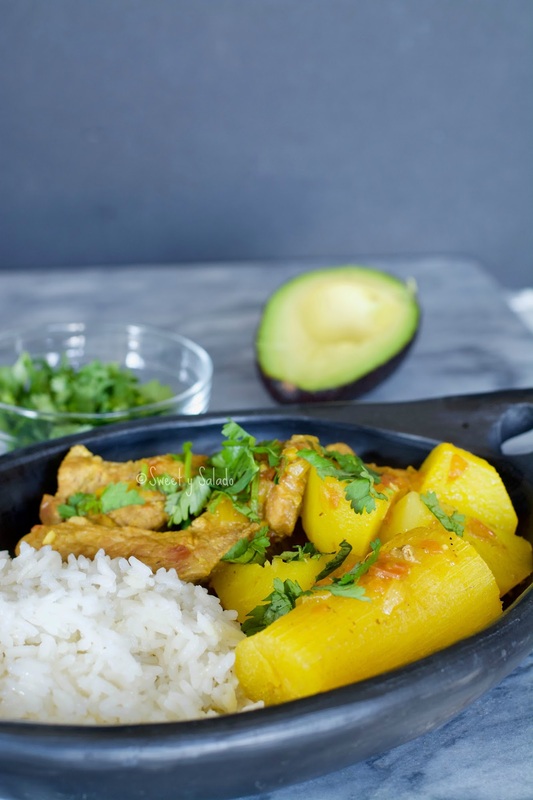 The fastest way to make any Colombian style stew is to blend all the veggies in a blender to make a tomato and onion sauce and that’s exactly how I made my version of Colombian chicken stew. Another way of making it, and a bit time consuming, although not by much, would be to chop the onion, garlic and tomatoes to make an hogao (onion and tomato sauce) and then add a little bit of water. Now, I have been yelled at countless of times for adding water to my stews because some people prefer to have a thicker, and in my opinion, drier tomato sauce, but that’s not how I prefer to make it. I love having a nice and juicy tomato sauce in my stews so that I can pour it all over my dish, and yes, all over my white rice as well. To me, that’s they way it should be made but if you don’t like adding water to it… don’t add it. It’s your kitchen and you should make it the way you like. Heat the olive oil in a large pot over medium heat. Add the white onion and cook for about 3 minutes or until translucent. Add the green onion and garlic and cook for 1-2 more minutes. Now, add the chopped tomato and cook for 5-8 minutes or until it softens. Season with ground cumin, food coloring, salt and pepper. Add water and pork ribs and mix well. Cover the pot, bring to a boil on high heat. Once it's boiling, reduce to medium low and cook for about 35-40 minutes. Add the potatoes and cassava. Cover once again and bring to a boil on high heat. Once it's boiling, reduce to medium low and cook for about 20 minutes or until the potatoes and cassava are cooked through. Taste for seasoning and add more salt if you think it needs it. Serve this stew with a side of white rice, avocado and a delicious Colombian simple salad.